Fine Gael and Fianna Fáil are continuing their efforts to form a minority government. 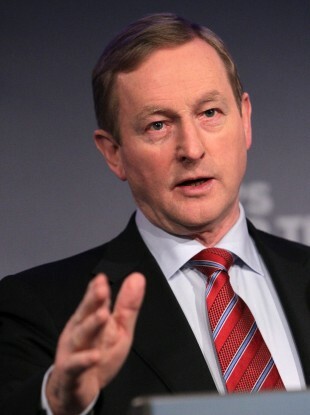 TAOISEACH ENDA KENNY has told independent TDs that the choice facing them is either supporting a Fine Gael minority government or a second election. The Fine Gael leader made the comments during ongoing talks with 15 independent TDs about the formation of a minority government. Fine Gael has made clear it will not support a Fianna Fáil minority government, despite Micheál Martin’s party continuing their own discussions with independent deputies in a bid to win support. The Fine Gael-led talks have entered their third day at Government Buildings with the Green Party no longer taking part after it said earlier it would not enter government with either Fine Gael or Fianna Fáil. The talks have so far focussed on housing, jobs and rural development, mental health and how a partnership government would work, with Fine Gael minister Richard Bruton last night outlining how there would be a more open budgetary process. A paper on climate change that was presented this morning was said to be well received and there was a discussion on a disability paper which requires further costings. Justice and equality issues were discussed this afternoon with education on the agenda later. There have been several bilateral meetings on the fringes of the talks with Kenny meeting with the brothers Michael and Danny Healy-Rae earlier. Speaking after three days of discussions with Fine Gael and talks with Fianna Fáil this evening, Green Party Leader Eamon Ryan said that his party will not be supporting either in a minority administration. Ryan also said that he doesn’t think either party will be able to form a minority government with the support of independents alone. Both he and his Dáil colleague Catherine Martin outlined these views to their own party members this evening. Ryan said his party was speaking with both Fine Gael and independents but that there were “significant difference” between themselves and others. “We do not believe it would have the necessary numbers to provide a stable administration, which could set our country in a new direction,” he said. We had similar talks with Fianna Fáil this evening but it appears that they will similarly be unable to establish a broad rainbow coalition to set up an effective minority government. Ryan added that his party will continue to try to assist in the formation of a government but from the opposition benches. The final decision from the Greens comes after what he told reporters was “frank discussion” with Enda Kenny last night. “The Taoiseach asked us a question last night – it was a very frank discussion – in terms of he had to know where everyone stood, were we likely to be able to go into government set up, take office. What we said is we don’t think it’s going to work for us on this occasion,” Ryan said. A Green party spokesperson also confirmed that the Greens would “probably be in opposition”. Waterford TD John Halligan, who is part of the Independent Alliance, said yesterday that it would be “very difficult” for him to agree to a deal with the Fine Gael. The pace we’re going at at the minute means it would take us a year [to form a government]. Some independents have also met with Fianna Fáil today as it attempts to form its own minority government. However, politicians on all sides of the various talks appear to acknowledge that negotiations between Fine Gael and Fianna Fáil are inevitable. Micheál Martin told the independent deputies who questioned his stance that it was up to the Taoiseach to make contact with his party and not the other way around. Speaking on Morning Ireland earlier, Fianna Fáil TD Thomas Byrne ruled out a coalition deal with Fine Gael, but not the idea of supporting a minority Fine Gael government. However he stressed that Fianna Fáil is still attempting to form its own minority government. Fine Gael plans further talks with independents tomorrow and on Friday with a view to developing position papers that could then be presented to Fianna Fáil as early as this weekend. There has also been a suggestion that contact between the two largest parties in the 32nd Dáil could be made as early this evening. But Fianna Fáil is also hoping to hold further meetings with independent TDs on Monday and Tuesday of next week. It’s been a month since the election and we still have the farce where the two parties with the biggest mandates and the biggest number of seats are not talking to each other. We believe that they should. He defended his own party’s reluctance to enter any government talks, insisting that Sinn Féin did not get a mandate to do so. “We sought a mandate to lead a government, we didn’t get that,” he said. We do have a mandate not to prop up these parties and we’ll keep to that. Email “Enda warns independents: It's a Fine Gael minority or a second election”. Feedback on “Enda warns independents: It's a Fine Gael minority or a second election”.